One of many huge clashes to come . . . The Gendarmerie has objected to coming under civilian rule, which is one of the proposals in the government's draft National Program to be submitted to the European Union. The Gendarmerie Command, which is under the military, sent a letter to the Interior Ministry on Sept. 26, noting that they had learned about the proposed changes from the media and that the change ran counter to the suggestions they had made, reported daily Taraf yesterday. The letter published by the daily was signed by Lt. Gen. Mustafa Bıyık. It objected to the pledge that all internal security apparatuses would come under civilian rule. This is interpreted as placing the Gendarmerie Command under the Interior Ministry. The police department, which is in charge of security in urban centers, is under the Interior Ministry, while the Gendarmerie, in charge of security in rural areas, is linked to the military. 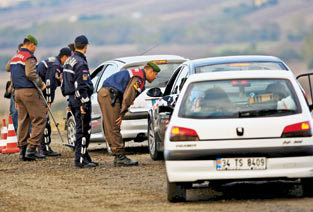 The Gendarmerie's range of authority covers 92 percent of the country geographically. In the letter, the Gendarmerie then asked the government to remove the said pledge from the program. The daily said the government's response would be seen when the National Program was presented for parliamentary approval. For an excellent look at the exigency for bringing the Jandarma under the control of the Interior Ministry, see Lale Sarıibrahamoğlu's analysis in TDZ. Yesterday, TDZ ran a story about the government's intention to conduct counter-terrorism operations in a manner consistent with the new NPAA. Gen. Bıyık's letter in Taraf makes it clear that many of the governments' designs to do just this will be hard-fought.